OK, time for a confession - this review is only hear so that I could justify putting the amazing 'Judo Mambo' on the radio player. So There. End of review. No, i'll say a bit more. 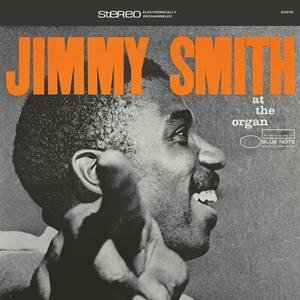 This is an early Blue Note period Jimmy Smith album, so you know exactly what you're going to get - the trio format, and a set of cookin' originals and slightly schmaltzy standards. The originals stand out here - 'Judo Mambo', as you'll have realised by now is a bit of a standout, with it's latin rhythms and the fantastic playing of Jimmy and Thornel - just listen to the way they comp behind each others' solos - pure magic. Also worthy of a mention is a stab at Monk's 'Well, You Needn't' that comes off well with Smith making it his own, and even going on to imitate the great pianist on the closing 'Slightly Monkish'. His organ sound here varies a lot - there is some of the off-putting seaside wurlitzer vibrato on a few tracks, but mercifully he gets his stops right for the majority of what is an excellent album. This is actually a recent Blue Note reissue on CD, in their excellent 'RVG Edition' series. Tracks 1-7 comprised the original LP released in 1956 as BLP 1525. Track 10 first appeared on a 45 in that year, with the others (8, 9 & 11) not seeing the light of day until 1997 (on CD - B2-57191 - not sure which album, though). Slightly Monkish is one of my favorite tunes off this cd, it sort of hints at what Larry Young would be doing years later.